Yesterday afternoon, 5pm, I saw a email alert in the lower right of my laptop screen, a WSJ email alert, Yahoo was turning over the Company to Jerry Yang. We all knew that Semel was in trouble and that a leadership change was likely. The surprise was the choice of Jerry Yang. I stopped what I was doing and blogged my reaction to the news. When you blog a news story, you need an anchor post. I went to the WSJ, but they didn’t have a story, just a "breaking news headline". Plus I always worry about linking to a WSJ story because its a paid site and my link could be dead. So I went looking for something more authentic. 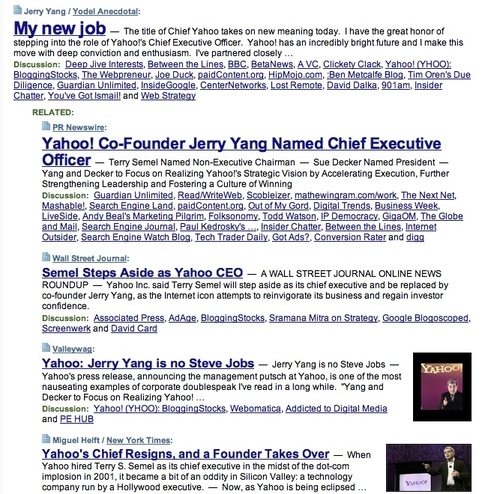 I went to Yahoo’s press release page, found the release, and linked to it. Seemed like the logical anchor. I also ganked the cool photo of the Yahoo! guy in the chair reading the paper from that page. I replied to all that I had just posted on the news. An interesting discussion ensued on Twitter. Then I went to Techmeme to see what was going on there. I saw that Jerry Yang had a blog post on his new role. I figured that was the better anchor link for my post and I changed it to Jerry’s post. I also read all the links to Jerry’s post and some of the links to the PR Newswire story. I went back to Techmeme a couple more times last night and read the WSJ’s story, the Times’ story, Valleywag’s take, and Arringtons’ take as well as a dozen or so interesting links. By the time I went to bed last night, I’d read everything I wanted to read on that news. I know that Techmeme is not the sole arbiter of whose take on the story is the most important, but frankly it’s the arbiter that I pay the most attention to these days. Gabe’s got Jerry’s post as the top take on the story. As it should be. He’s in the hot seat now. Let’s hear what he has to say first. Then the official release. Then the WSJ (still the paper of record for the business world even though they still refuse to play nice on the web). Then Valleywag followed by The NY Times. Has Valleywag taken over the Merc’s role as the Valley’s paper of record???? Below the fold on Techmeme, you’ve got Rafat, Om, Kedrosky, cnet, CNN, and a few more stories. All good reads for sure. And there’s literally close to 100 links to posts like mine you can read if you want to know everything the blog world is saying about this story. That’s how news breaks and then takes in my world. I am sure most of you who read this blog do it the same way I do. I am equally sure that we are the minority and that most people are going to read the news for the first time this morning in their local paper. But I think the way it goes down in our world is the way of the future and services like Techmeme are going to be the new arbiters of how news takes.